A HUGE thanks to everybody that ignored the weather forecast and came along on Saturday! It was another great Festival. 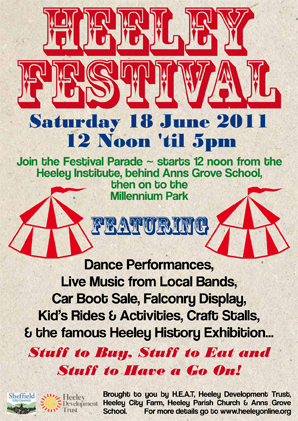 Heeley Festival, Saturday 18th June on Heeley Millennium Park, from 12 noon to 5pm. Live music from Twins, The Voxettes, Pallav Roy, Right Turners Beware, plus Boomshanka Bellydancers, Stepping Out Dance Troupe. Falconry display from Phoenix Falconry, Bongo Bert drum workshops, Musical Works Street Dance, BMX obstacle course, rides and slides, food and craft stalls. Car boot sale at Anns Grove Primary School, Heeley History Exhibition at Heeley Parish Church and more live music and 30th birthday celebrations til 8pm at Heeley City Farm. Letters have now been posted to all stallholders that have sent in a booking form and full payment. The letter gives details of where your stall is located and a preferred time of arrival on Saturday. If you havn’t received a letter yet but have sent in a completed form and payment, please give us a call at Heeley Dev Trust on 0114 2500613 so we can confirm your pitch number. A big thanks to everybody that has booked a stall for the Festival. We are just finalising the layout on the Millennium Park and will be in touch shortly with details of where your pitch is and what time you need to arrive, any other questions please give the Festival Team a call on 0114 2500613 (choose option 1). There are still a few spaces left for the Car Boot sale – see comments below for contact details. Have you set a date yet for the Festival?. I left a message ages ago saying Totley History Group are interested in having a stall for a small exhibition. Hi Ann – Ive checked re date of Festival and the date that has been provisionally set is Saturday June 18th 2011. This should be confirmed shortly and details of booking stalls will be out soon after. Are you happy for me to pass on your email address so that you receive any information that is sent out? Hi. 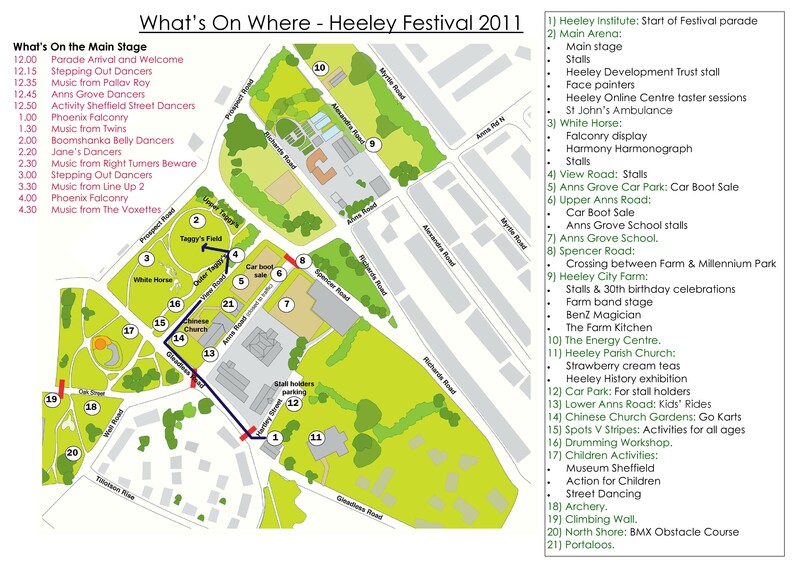 Sorry for the late reply, and thank you for letting me know the provisional date for the Heeley Festival. I am quite happy for you to pass on my e-mail address. The Car Boot is being organised by Anns Grove Primary School. Ive been in touch with them this morning and there are still a few spaces left – the contact details are Donna (0114 2589136) or Liz (0114 2645379). Hope that’s useful. Hi there< what time does the car boot start please? Hi Mark, sorry – only just picked up your question. Hope you managed to get to the car boot in time. be a free cuppa tea in it 4 u!